Do you look forward to crossing national and cultural boundaries? Do you believe that individual efforts can change the world? Do you desire to listen to and understand the different voices of the world? Do you yearn to experience what can be created when elite students gather together? 1 City, 7 Days and Nights, and 20 students from all across the globe! We look forward to meeting you and hearing about your unique stories and experiences. Join us to experience a different culture, a new life-style, and fresh international perspectives, all while making lasting friendships and honing important personal and pre-professional skills. Embrace this life-changing opportunity and join the IMUSE conference to become part of a new group of empowered future leaders! To challenge and inspire our delegates to be “globally proficient” through widening their cultural perspective, encouraging innovative collaboration and critical thinking, and emphasizing skills such as leadership and social responsibility, thereby equipping delegates with the skills to adapt to and thrive in new environments as well as enact high-impact, culturally-informed positive change. 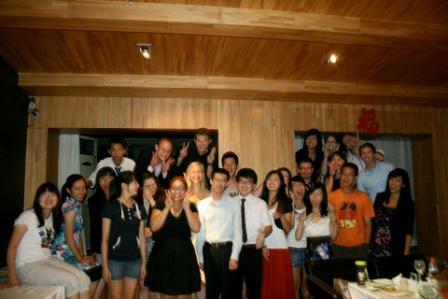 From the 2008 tour of North American Universities, to the 2011 University of Oxford-Chinese Conference, to the 2012-2014 exchanges in Beijing and Hong Kong, it is evident that IMUSE participants are not only delegates of their respective countries, but also global citizens and future leaders in our increasingly interconnected world. Over the years, IMUSE has always stayed true to its original vision of helping students learn to embrace and thrive in our globalized society. It has provided students with an opportunity to experience cultural differences, form and share innovative ideas, gain insight into new perspectives, and work together to apply this global knowledge and cosmopolitan understanding in ways that can meet the demands of our complex and changing world. Because of this, IMUSE's program has been succeeded year after year by extraordinary delegates, dedicated staff, and a large community of IMUSE supporters. We’re excited to open applications for IMUSE 2015! The China Career Development Forum, where delegates can learn from and network with successful entrepreneurs in China. A case study competition, sponsored by Hejun Consulting Group, a top consulting firm in Beijing. Visits to top universities, hospitals, and local NGOs within Beijing. 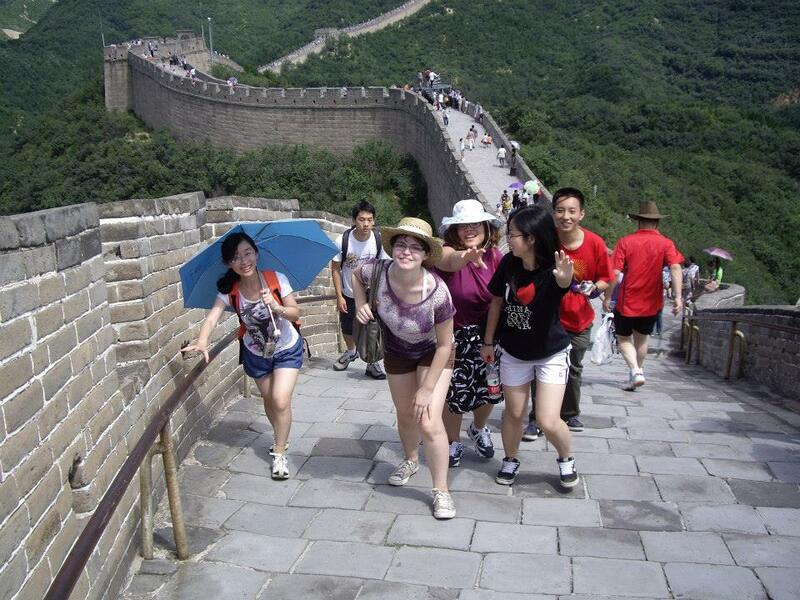 Sightseeing at many of Beijing’s most popular attractions, including the Great Wall and the 798 Art District. An outdoor concert, showcasing local independent musicians on Tsinghua University Campus. This year, IMUSE will be held in Beijing, China on August 12-20, 2015. Delegates are expected to arrive in Beijing by 5pm on August 12th for registration purposes. Please note that these dates and times are in China Standard Time. The conference (including food, lodging, and transportation) will be free of charge to delegates, and airfare to and from Beijing will be subsidized via reimbursement upon arrival in Beijing; the exact amount of subsidization is still being determined. Any additional costs incurred in Beijing that are unrelated to and/or outside of the IMUSE conference will be the delegate’s responsibility. The application process will consist of two steps. Applicants must first fill out a written application below. Applications will then be screened and successful applicants will be contacted within a week after the deadline for a short Skype interview. Final decisions will be made shortly after the interview, and all applicants will be notified via email of their status. Individuals that accept positions as delegates of this year’s conference will be required to pay a small deposit (to be returned upon arrival in Beijing). Failure to attend the IMUSE conference after accepting an offer as an IMUSE 2015 delegate will result in forfeiture of the deposit. The deadline for completion and submission of these applications is Saturday, April 18th at 11:59pm Eastern Standard Time. The deadline for completion and submission of these applications is Thursday, April 30th at 11:59pm China Standard Time. Rose-Ann is a senior from Brooklyn, NYC. She began informally learning Chinese in high school to supplement a Taiwanese drama addiction before formally studying China at Harvard. 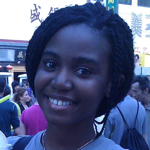 Rose-Ann is joint concentrating in East Asian Studies and Anthropology and minoring in Global Health. She enjoys languages, health policy, and sweet foods. 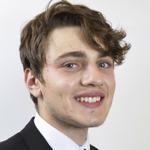 Schuyler Berland is a junior at Harvard College studying social anthropology with a minor in economics and a citation in Spanish. He enjoys traveling and taking photographs during his free time. 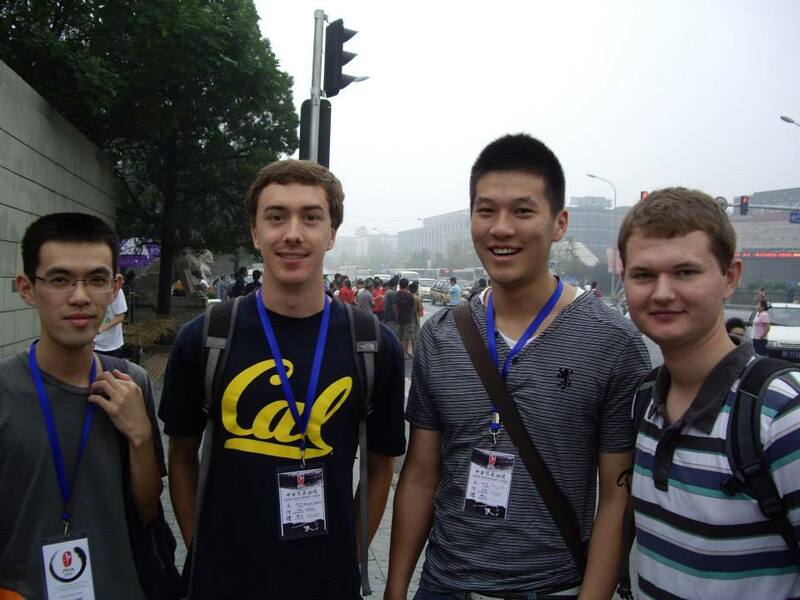 Having participated in IMUSE’s 2014 conference, Schuyler is excited to again travel to Beijing. 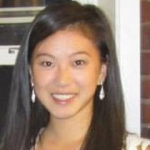 Annie Lin is a sophomore at Harvard, concentrating in Computer Science. 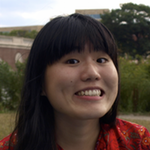 She is also on the Board of Harvard Women in Computer Science and Co-president of Harvard’s Taiwanese Cultural Society. Her other hobbies are like that of an old person- knitting, gardening, biking slowly, and collecting knick-knacks. Angel Jin (金童) was born near Hefei and spent the first six years of her life in Nanjing before moving to the Boston area. She is currently a sophomore at Harvard University majoring in Economics with interests in both Government and Psychology. This past summer, Angel worked in Athens, Greece as an intern for Mr. George Papandreou, former Prime Minister of Greece. 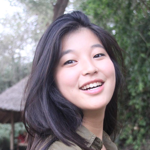 Amanda Fang is a freshman in Grays who intends on concentrating in East Asian Studies and Anthropology. 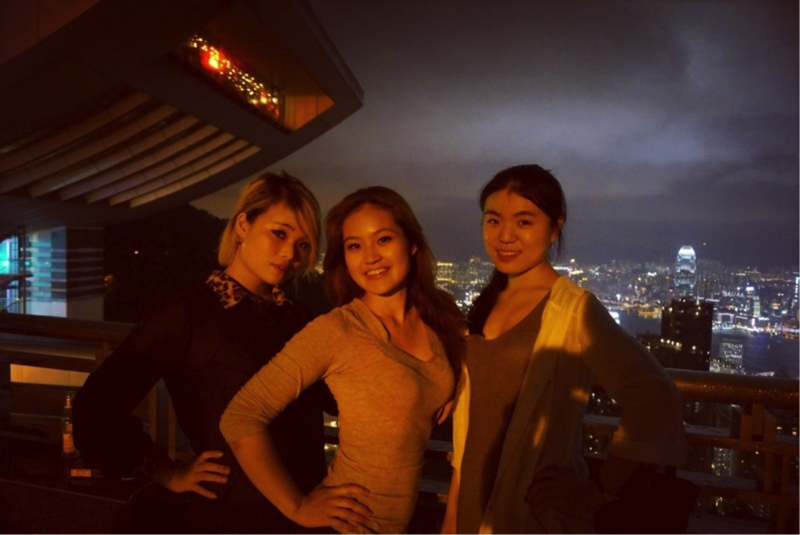 She grew up in Hong Kong and Beijing but attended boarding school in the United Kingdom. Aside from participating in IMUSE, Amanda also plays for the Harvard Varsity Women's Rugby team. She is passionate about improving the understanding between China and the world. 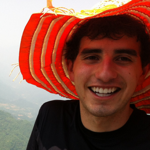 Adriann Negreros spent the past 2 years in China. He is a Harvard University sophomore who is very interested in fitness and (trying) to eat healthy. Also a big fan of basketball, FIFA, and Super Smash Bros. 我的微信号是: negrera2. 欢迎加我一下. Cara Jacobson is a freshman in Canaday who is likely to concentrate in government. She is from Long Island, New York. 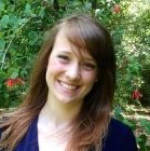 Cara is passionate about studying different cultures and would love to improve understanding between the US and China. In her free time, Cara sings in the University Choir and acts in HRDC plays. 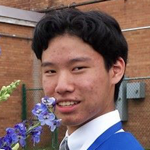 Benjamin Zhou is a Junior at Harvard College concentrating in Applied Math born on Prince Edward Island, Canada, and raised on the sunny shores of Southern California. His interest in IMUSE stems from a strong interest in Chinese affairs as the son of two first generation Chinese immigrants, and the descendant of a large extended family still residing in China. In his free time, Benjamin enjoys playing basketball, doing long hikes, and writing things on large whiteboards. 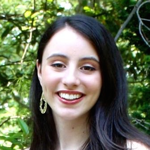 Brooke Nowakowski is a junior in Quincy House and an East Asian Studies concentrator. Outside of her interest in the political and social relationships between the U.S., China and Japan, she is interested in venture formation and general entrepreneurship. She currently serves as a co-founder at Spray Cake L.L.C, a consumer goods startup founded in January 2014. Chris Li is a freshman from Millburn, New Jersey. Although undecided on a concentration, he is interested in Comparative Literature, Government, and Molecular Biology. 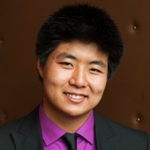 Chris plays viola and is involved with the Harvard China Forum, PBHA, the Harvard International Review, the Board of Strategy of the IRC, and the Undergraduate Admissions Office. In his free time, he enjoys pretending to read French literature, overusing Snapchat, and cats. Baidu is a Chinese web services company headquartered in Beijing, offering many services including a Chinese language search engine for websites, audio files, and images, as well as an online collaborately-built encyclopedia, and a searchable keyword-based discussion forum. Hejun Consulting Groups is one of the largest comprehensive consulting companies in China with over 1,000 employees and conducts more thant 300 management consulting and financialy advisory projects each year. Google China is a subsidiary of Google Inc., the world's largest Internet search engine company and ranks as the number two search engine in the People's Republic of China. 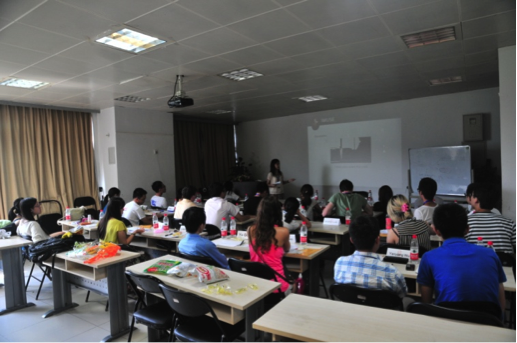 IMUSE is a non-profit organization aiming to foster a strong relationship between young Chinese and U.S students. Our annual conference is always subsidized for delegates, and all ground transportation, food, and events are free of charge. We want to keep our conference financially affordable for all our delegates. In order to do that, IMUSE needs your help! Any monetary donations or company sponsorships are greatly appreciated and all proceeds would go to making our Beijing conference as memorable as possible. Please contact us (using the form below) or e-mail admin@projectimuse.org if interested in donating or joining our organization. 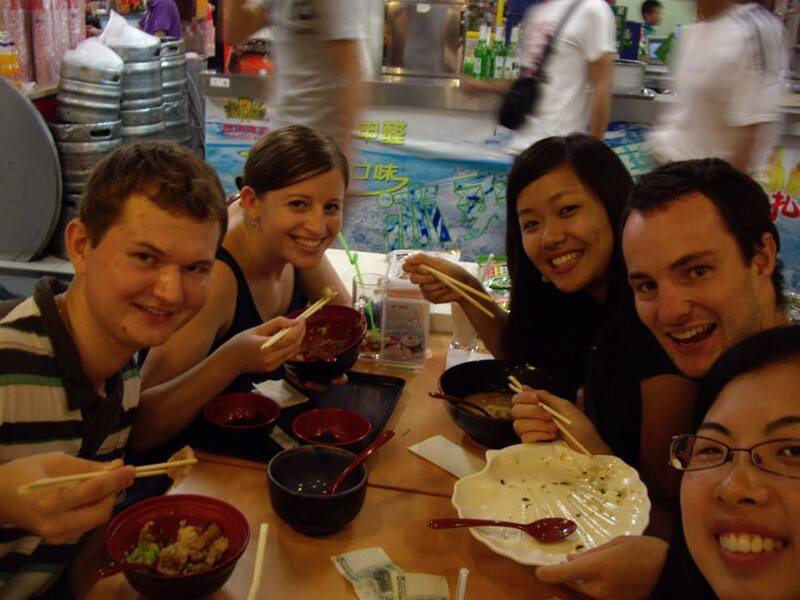 In the winter of 2007, IMUSE selected fifteen student delegates from over 600 applicants at Tsinghua and Peking Universities to visit eleven North American universities in the spring of 2008. At each institution, the delegates engaged journalists, academics, and local student leaders before a local audience in moderated panel discussions about a number of different topics concerning China, such as its increasingly influential role in the global marketplace, its slowly westernizing culture, the balance between its environmental consciousness and its economic growth, and more. Specific topics of discussion were based on the results of the “My Top Ten” poll posted on our website last winter and spring, which received over 1200 responses from hundreds of different schools. In concert with these panel discussions, IMUSE offered other on-campus events at each university, including talks by prominent guest speakers from Dr. David Kang to Mr. Jet Li, documentary screenings, “Landscapes of Modern China,” a professional photo exhibition prepared by Kodak, and a variety of school-specific workshops, performances, and other activities. Since North American Campus Tour events were limited to select schools, IMUSE also designed the "China in My Eyes" essay and photography competition, open to all North American postsecondary school students. The competition encouraged its entrants to carefully examine their own views about China and convey their ideas through original essays or photographs. The six grand-prize winners of the essay and photography competitions received either a new Lenovo laptop or a spot in our Beijing Olympic Summer Fellowship Program. The twenty runners-up each received a set of five officially licensed Beijing Olympic souvenir coins (global circulation: 60,000). All competition winners received personalized certificates and publication of their winning entries on our website. From winter 2007 to spring 2008, the IMUSE website hosted a survey regarding various issues being addressed by China today, from environmental pollution and governmental corruption to human rights and religious freedom. North American postsecondary school students were eligible to select ten of twenty choices that they felt demanded the most urgent attention. The survey ultimately had over 1200 responses from hundreds of different schools, and the results were used to design the questions for our North American Campus Tour panel discussions. Three of our five grand-prize “China in my Eyes” competition winners and our “My Top Ten” survey winner attended the 2008 Beijing Olympic Summer Fellowship Program in Beijing during the first two weeks of August 2008. The purpose of the fellowship was to broaden the North American students’ perspective on China by bringing them not just to traditional tourist sites but also to places of historical and contemporary significance. Each fellow was assigned a Chinese student liaison to help them with language and culture differences as well as deepen and personalize the exchange experience. In addition to visiting a number of cultural sites, attending Olympic events, and participating in academic lectures and conversation tables, the fellows and liaisons also held a public panel discussion at Peking University similar to those hosted by our fourteen Chinese delegates during the North American Campus Tour Program. Be sure to read about two of our 2011 delegates, Kiryl Melnichak and Jennifer Lindsay, and their responses to the IMUSE conference HERE! 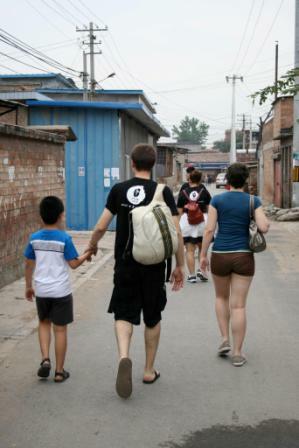 The 2011 Fellowship began with a half-day forum event at the prestigious Peking University spotlighting philanthropy and social entrepreneurship in China. Our delegates got the chance to interact with representatives from groups and organizations leading the way, such as UChange, CSR-Asia, China Youth Action Network, and Xiaoying Plan. Renowned professors from top Chinese universities such as Peking University presented on issues ranging from the Chinese healthcare reform to the economics of the rural-urban divide in China to China's rise as a world power. These presentations were followed by informal Question and Answer sessions with the professors. 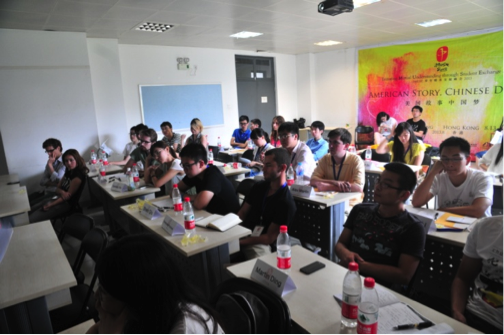 This full-day event introduced fellowship participants to the process of developing effective business pitches and provided an inside look into the differences between doing business in the US and doing business in China. Delegates split into small teams and prepared comprehensive company expansion strategies tailor-made to a number of handpicked firms. Business proposals were later presented to top management at Hejun Consulting, one of the premier consulting firms in China. In the process, our delegates received significant feedback and in-house coaching from senior-level Hejun consultants. It's definitely not all business, work, and academics at IMUSE! 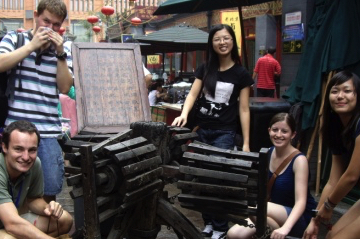 Our delegates revisited grade school years through a good ol' scavenger hunt game played in Beijing's most celebrated commercial shopping boulevard: Wanfujing. Got scorpion sticks? Stone yogurt jars? How about the elusive Well? IMUSE staff rented the largest private room in a famous Beijing karaoke hall for a fun-filled night of top American pop and classic Chinese oldies. What ensued was an amazing showcase of the skills of the many hidden singing talents among our delegates! In this new collaboration with New Citizen Plan, IMUSE delegates were allowed poignant glimpse into the lives of children caught in the deep rural-urban divide in China. In this half-day visit to one of the many impoverished migrant children's schools in Beijing, delegates got the opportunity to hear firsthand from these children about the impact wrought by their displacement and ensuing soft marginalization. This event gave delegates a greater awareness of the often-overlooked costs of rapid economic development and urbanization. These sessions at the prestigious Tsinghua University introduced IMUSE delegates to various and varied aspects of the economic, political, and social landscapes of China. Selected speakers included the notable political blogger Michael Anti, the Secretary General of Vantone Foundation Li Jing, the co-founder of China Fine Art Management Christopher Reynolds and the Director of Technical Development at Hyatt International Daniel Wang. A huge part of cultural exchange is, well, culture! In the spirit of that assessment, IMUSErs sat down for some informal conversation with their peers. What did they chat about? We can't tell you that... but we can tell you that the conversatin' took place over tea and teatime snacks in a private tearoom reserved for IMUSE located in one of the oldest teahouses in Beijing. Fellowship participants received an exclusive look into the inner workings of Baidu, the leading Internet search engine provider in China. Company representatives gave our delegates a private tour of the Baidu complex, introducing the firm's unique history, culture, and mission. IMUSE delegates were able to rendezvous to the ever-famous and beautifully rebuilt Badaling section of the Great Wall of China. The wall featured 4.7 miles of trail, towers, and steep climbs, but the delegates were rewarded at the end with beautiful scenery, an experience at one of China's most prized cultural relics, and quite a lot of photos. Delicious! Delegates gathered around multiple hot pots around their tables to cook and eat many delicious Northern China specialities, originally favored to keep the Chinese warm in the winter. Selections included thinly sliced lamb and beef, as well as tofu cubes, leavy veggies, mushrooms, fish, and more. Delegates were given free time to explore some of the modern artworks in the 798 Art Zone of Northeastern Beijing. Housing pieces of art from famous Chinese artists such as Yue Minjun, the Art Zone occupies a decommissioned former military factory buildings. Along with its numerous art galleries, 798 boasts a growing cafe culture as well as a number of shops with cool stuff. Delegates visited the American Center for Educational Exchange, an outreach arm of the official American Embassy in Beijing. Delegates attended a presentation by representatives of the industry, where they learned of topics such as the American policy towards Taiwan and found time to browse the library of the center. The most emotional and touching of the IMUSE events, delegates attended a catered dinner on the top floor of a fancy restaurant, where they were able to talk with each other and reminisce about the days of IMUSE and share their dreams and aspirations. At the end, closing wishes were given and the closing slideshow was presented. After, the delegates said their goodbyes as they left Beijing to embark on their separate adventures. 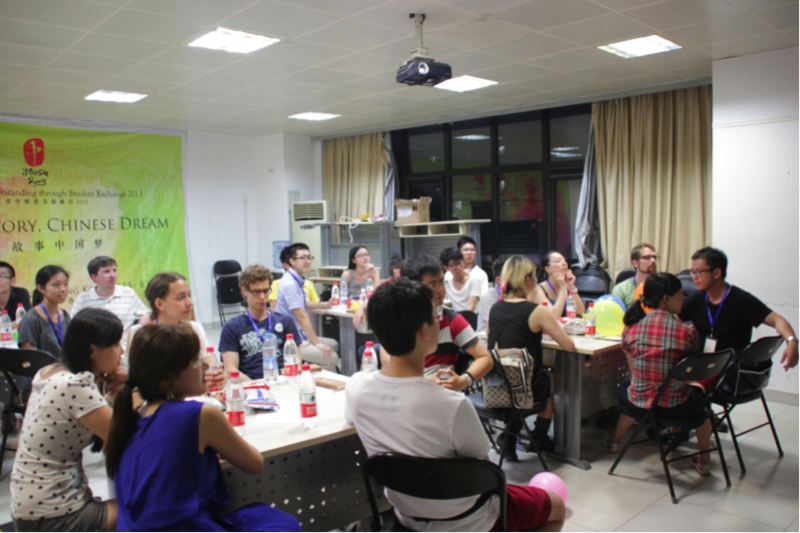 IMUSE 2013 kicked off with some ice breakers at Tsinghua University to help the delegates get to know each other. 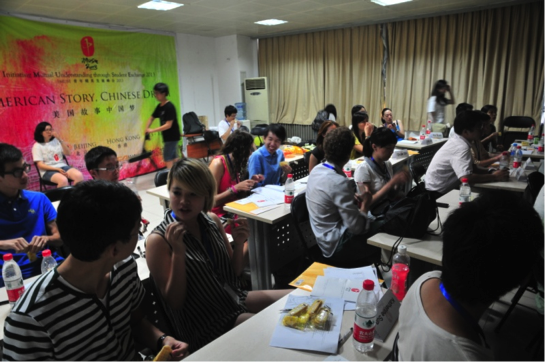 Afterwards, the IMUSE organizing committee outlined the jam-packed schedule of events for the Beijing session. Delegates spent two days at a training center for outdoors surviving skills in suburban Beijing. They practiced walking through a single-plunk bridge and crossing the “forest” at midnight, then held a campfire party and with several group games and contests. 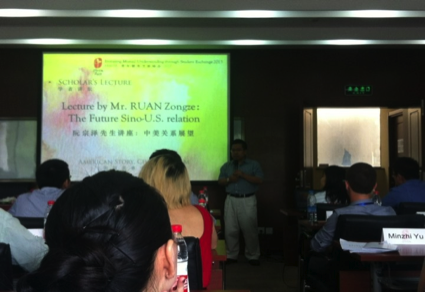 Ruan Zongze, Vice President of the China Institute, delivered a speech named about the future of Sino-US relations. With China rapidly advancing in the international scene, he emphasized the importance of communication in international relations and encouraged students to deepen their understanding of each other. Afterwards, Zheng Peiming, founder of the Shanghai Rongzheng Investing and Consulting Company, spoke about his experiences in starting his own company. He compared the cultural and economic environments in China and the U.S. and how they affect businesses. Delegates watched a pair of videos that represented views on the “American dream” and the “Chinese dream.” The first was Richard Wilkinson’s TED talk, “How Economic Inequalities Harms Societies.” The second was a film shot by Tsinghua students about a blanket craftsman in Tibet. Delegates discussed the concepts of equality, development, and the protection of art and cultural heritage. 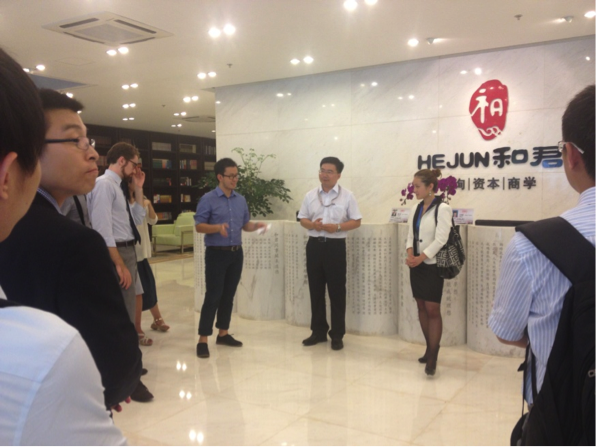 Every year, IMUSE visits the Hejun Consulting. Activities included a cultural workshop on calligraphy and painting, as well as a professional workshop involving consulting competition. In the competition, delegates split into teams to develop strategies for given businesses. Later, a panel of senior-level Hejun consultants gave feedback and awarded a prize to the winning team. Delegates participated in a meditation session led by an expert, and complete with relaxing music. As meditation is a way to better understand oneself, the process for involved a bit of soul-searching: delegates were asked to ponder what they were like as a child, what they are like at present, and they hope to be in the future. 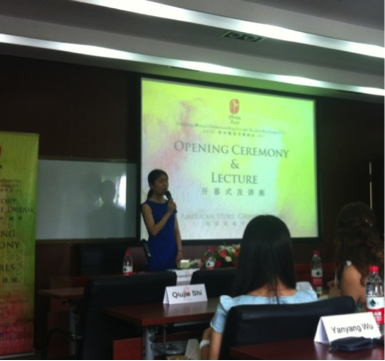 Li Shen of Peking University delivered the welcome address on behalf of IMUSE 2013 committee. Then, several conference delegates got on stage to share their stories. The ceremony concluded with delegates coming together to write their hopes for IMUSE 2013 on a postcard. Tea plays an important role in Chinese culture. 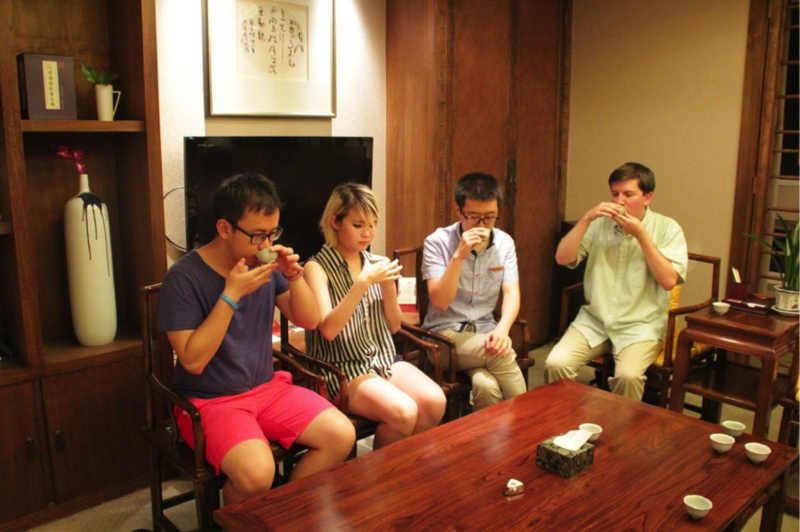 In this ceremony, delegates were trained in the fine art of making Puer Tea. Led by a hostess in traditional Chinese dress, delegates followed step-by-step instructions for brewing and serving, tasting the beauty of ancient Chinese culture. Bai Yanqing, Tsinghua University guest professor, shared his own stories of America, pondering the essence of the American dream and discussing hopes for the Chinese dream from the point of view of Chinese scholars. 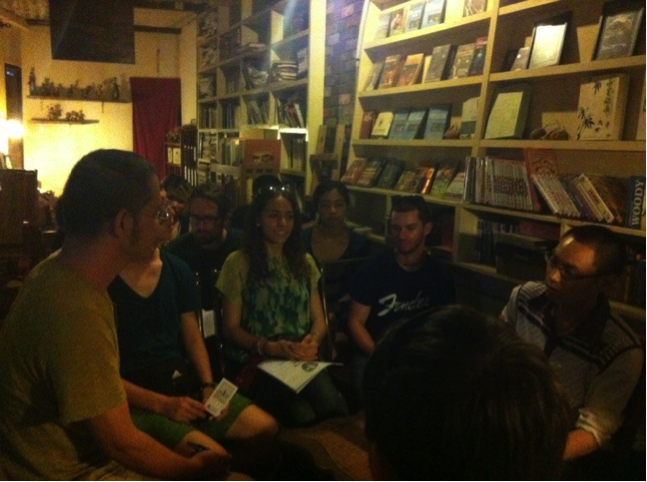 Delegates visited a picturesque bookstore owned by Zheng Yu and Mr. Lv. The owners spoke of their dream to provide an environment for readers, though that dream is being threatened by larger firms and e-Books. Touched by the idealism of this dream, delegates analyzed and discussed the situation and proposed some possible suggestions for improvement. Even the ten-hour train ride from Beijing to Shenzhen didn’t faze the IMUSE attendees, who chatted and played like family members the whole time. After arriving in Hong Kong, delegates took a tour of K11, a distinctive “art mall” that integrates art exhibits with retail stores. They then made their way to a slum called Sham Shui Po, an area that starkly contrasts with the rest of the metropolis that is Hong Kong. The residents of Sham Shui Po are faced with many difficulties associated with poverty, such as crowding, lack of living space, poorly-constructed homes, and lack of sanitation. Delegates were so deeply shocked when they visited SoCO, a local charity, where they raised questions and suggestions on public welfare, wealth gap and social mobility. The ceremony begins launched with the presentation of each groups’ projects in the business planning workshop. Afterwards, each delegate shared their favorite stories and takeaways from IMUSE 2013 and signed their names on huge goodbye card. Although the closing ceremony marked the end of the IMUSE 2013 Beijing Session, was not the end of friendships built there. Application has not yet opened!